Open everyday, Six Flags Magic Mountain is known as the Thrill Capital of the World. The 260-acre theme park features world-class roller coasters, more than anywhere else in the world, and over 100 rides, games and attractions for the entire family! Six Flags is the home to both the DC Comics and Looney Tunes characters, so don't miss a chance to meet them, including Batman, Wonder Woman, or even Bugs Bunny or Taz. 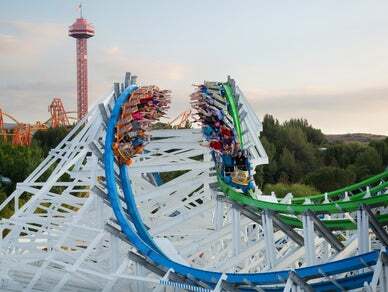 $25 off on admission on Good Any Day-General Use Tickets to the "Thrill Capital of the World" - Six Flags Magic Mountain! With over 100 rides, shows and attractions, there's something for the whole family. Now Open Daily! Go to www.sixflags.com/magicmountain and enter promo code LAFUN at the top right of the home page. Special Ticket Offered is $64.99 for a Good Any Day-General Use Admission Ticket.